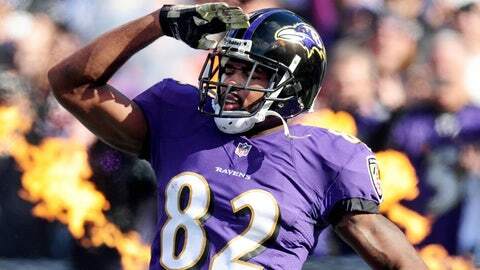 Torrey Smith is mad as hell and isn't going to take it anymore. That’s the tone that Ravens wide receiver struck on Twitter after his team’s big 18-16 victory on Monday night against the Lions. But why was he irritated? Maybe because some fantasy football players out there were upset that Smith caught "just" four passes for 69 yards and failed to score a touchdown. I am so pissed. I hate fantasy football. Screw megaton. Screw Moreno. Screw Thomas. And screw Justin Tucker!!!! Calvin Johnson I hate you so much right now it's your fault . People I want to die: Dennis Pitta. You ruined my night, my week, my season, and my life. That's all. Good night. Chiefs running back Jamaal Charles really got the brunt of it for daring to score five touchdowns against the Raiders. This you have to see to believe, although if you play fantasy football, there are guys like these in every league. And my fantasy season comes to an end. So depressing. I hate you Jamaal Charles. Who the hell has two A's back to back in their name anyway. Hey Jamaal Charles, I hope you die a horrible, pain-filled death. I lost fantasy playoffs by 5 points because of you. #soreloser #goddamnit! Rest in Peace, Team YOLOSwag (420). Die slow, Justin Tucker.